Kitchen idea for the modern home that uses black finish for the worktop and dining table combined with cabinets in a light beige finish. 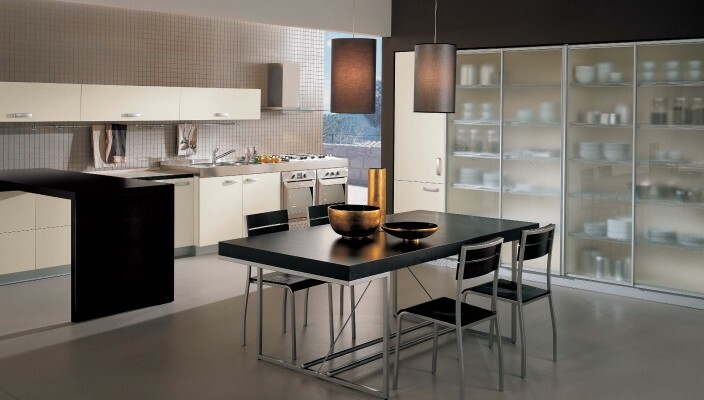 As the kitchen spaces get smaller, there is a strong need to use varied layers to make the best use of space. The design features portion of the countertop in a black finish with cabinets designed in a shade of beige for the best level of balance and contrast. A complete wall has been used for the kitchen area, and there is ample space to add a dining table with matching chairs in a black finish.